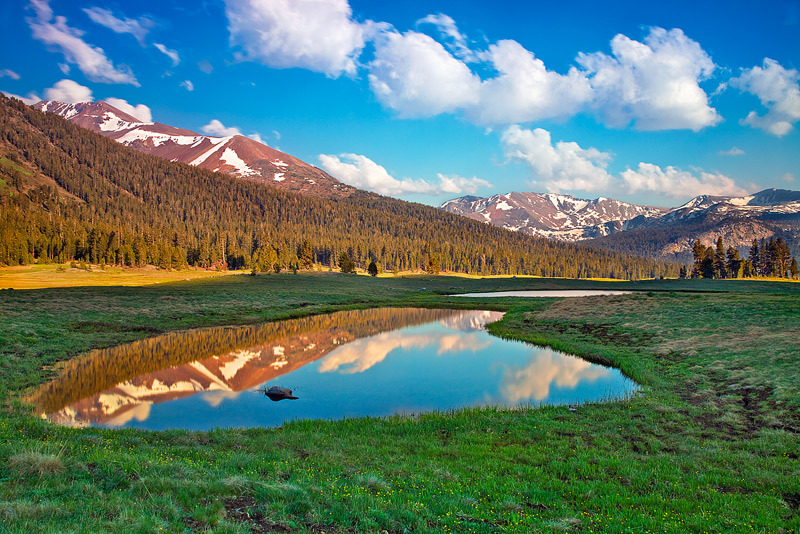 Early summer is a special time of year in the high country at Yosemite National Park, CA. A captivating, magical area with expansive, snow capped views and pristine, wide open beauty. I wanted to capture the feeling of space here in the meadow in combination with the clouds, light, water, snow, flowers and trees. This reminds how special Yosemite really is and what an awesome God we serve for creating it. For this image, I waited unit the light had just removed itself from the small tarn in the foreground for capture. It was also a bit tricky to get just the right amount of clouds in the frame in combination with a clear reflection as this was a 6 second exposure, which is rather long for an image taken outside during the day. Photo © copyright by Michael Greene.